This week, we are highlighting Kyle Dozier as Sales Bootcamp’s Fellow of the Week! After completing our online bootcamp, he was placed through our fellowship with GoFormz and has been working there since February 2018. Originally from the Bay Area, Kyle knew he wanted to move to Southern California after college. Prior to Sales Bootcamp, he was not sure what career path he wanted to pursue after graduation, but once he heard about our program through a friend, and after speaking with his father who also has a career in sales, he decided to check it out. Kyle was immediately connected with Sales Bootcamp’s Director of Sales, Nick White, who helped him every step of the way. By helping Kyle prepare for interviews and introducing him to professionals in the industry, Kyle felt that the assistance from Sales Bootcamp eliminated the stress he had going into interviews. Nick prepped him with the knowledge and skills he needed to succeed. 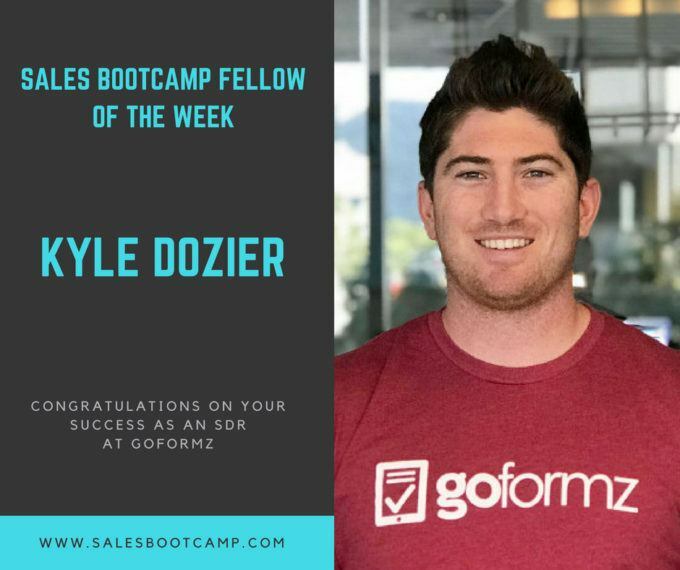 During Kyle’s first three months at GoFormz, Ashleigh Early, Sales Bootcamp’s Fellowship Coach, worked closely with him in transitioning into the new role. Ashleigh checked in on Kyle’s progress on a weekly basis, and she always had a response for any questions he had regarding prospect emails and phone calls. When he needed advice on specific strategies, Ashleigh was able to guide him, especially through problem-solving techniques. One of the things Kyle really struggled with was prioritizing who he needed to call and when they should be called. Ashleigh helped him by generating three different types of follow-up lists for him, and made sure he was able to apply what he learned to tackle similar situations. Congratulations to Kyle for his great work, and we wish him all the best for future success!